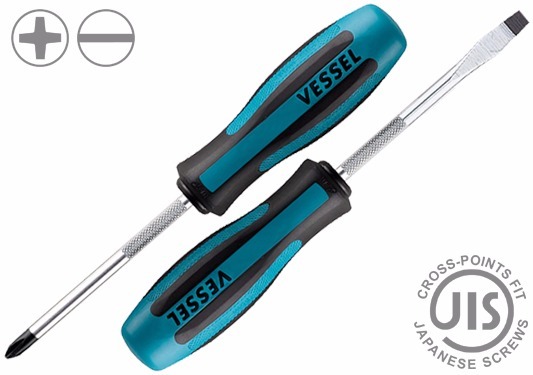 VESSEL Company made the 900 Series screwdrivers with conventional cross-point tips exclusively for JDV Products, Inc. These standard cross-point tip screwdrivers are recommended when working with JIS (Japanese Industrial Standard) screws. Applications include restoration and repair work, polished or plated screws, office and computer equipment, bicycles, remote control (RC) hobby equipment, and other general fastening needs. Other features include a fully hardened chrome vanadium steel shank for durability, magnetized high-precision black point tips, and a non-slip mesh handle surface for a secure grip in oily conditions. These screwdrivers are designed for professional use such as automotive repair and maintenance, electrical, construction, industrial work, and general fastening applications. Extra-Long Screwdriver (900 6x400) with a 16" (400mm) shank features a rotating grip to help stablize screwdriver.